Transylvania – the very word conjures up images of vampires, creepy castles and a thirst for blood. The reality though is flower-filled meadows, magnificent forests, Saxon churches, quaint villages and so much more. On the way there I’d taken the early morning ferry across the Danube from Bulgaria & was pleasantly surprised to be met by Costi, a Romanian motorcyclist who had been following my blog. He’d ridden from his home in Bucharest to meet each day’s ferry in order to welcome me into his country. At Costi’s parent’s home I was fed a delicious Romanian meal, and treated as an honoured guest with a guided tour of Alexandria. I was especially touched that Costi had taken a week off work to be at the ferry to meet me, and that he still checks in regularly to see that my journey is going well. Thank you my friend. We rode next day to Pitesti with his friend Andre joining us for part of the ride. Mike, another of Costi’s friends, arranged to have Effie securely locked up and hosted me for the night. While in Potesti, the guys at National Car Company Dacia welded 40 spokes and refused payment. It’s times like this that I am humbled by the generosity of people I meet. On road to Curte de Ages I asked the police if I could camp the night in the park and they escorted me to a campground in Noaptes where Adrian met me later that afternoon. Vali the campground owner, provides lovely chalets with hot showers, 2 beds per chalet, good toilets, breakfast, dinner & beers available. It’s a fantastic area for campers and well worth stopping overnight. (www.camping-arges.ro) Vali kindly offered me the use of his extensive workshop which he uses to service the KTMs he rents out to off-road enthusiasts. The gel seat Adrian gave me has been working wonderfully – it’s great to have a bit of comfort at last. We set off early the next morning for the Fagaras Mountains. Road twisted and climbed up to 2000 metres. Despite a few rough patches it was not as bad as I’d been led to believe. Adrian did the honours by push starting Effie about 20 times and in the end became quite crafty by flagging down other motorcyclists and encouraging them to share in the experience! I have to say on this ride it was the best scenery I’ve seen to date with amazing views – mountain peaks and switchbacks all the way down. Once over the mountains Adrian rode on to Sibiu with the intention I would join him later in the day. I got stopped by police for not having a light on and explained to them with a touch of humour that carbide for the lamp was hard to find in the local shops. One even asked me if I needed a licence for that thing? When I said yes, he asked to see it. I gave him the blog address, told him what I was doing and eventually I was waved on after they had a real good look over the bike. I’m considering using the LED light that’s in the lamp when I reach towns and then charge the battery at night. That way I may avoid any hassles. Next morning I only did about 2 kms when the inlet valve spring clip broke. I overcame this by using a portion of a spare cut exhaust valve spring. I took the back roads to Turda and after coming down the steepest hill I’ve ridden in my life, decided to spend the night in Sugag after only doing about 46 kms. With the brake hard on and the engine killed, the slowest speed I could get down to was 19kms per hour. I was fair bricking as there was no way I could have stopped even when I saw large earthmoving equipment clearing a rock slide on the far side of the road, so I just prayed there was no oncoming traffic. Even if I’d jumped off I couldn’t have held the bike it was so steep. Luckily nothing got in the way. A pretty hairy ride for sure and one I’ll remember for a very long time. The hairpin bends were made even trickier for a long wheelbase motorcycle because of the sand in the middle of each corner, just as I’d been warned. Lots more climbing next day but more gradual and fortunately I didn’t need to push or pedal. I stopped for a cup of coffee and a bit of a rest at the Benstar fuel station and Crisan Beniamin generously offered me 6 litres of fuel for free. I’d already filled up a short time before so accepted two litres for my reserve fuel container – thank you Crisan. Heading on to Turda I took a short detour to a Dumbrava Monastery at Judetul Alba where the nuns fed me a lovely lunch – more food than I could eat in a week! The monastery with its beautiful tended and colourful gardens, cares for 87 orphans and 40 aged persons. It was late afternoon when I rolled into Turda and met up others arriving for the weekend. 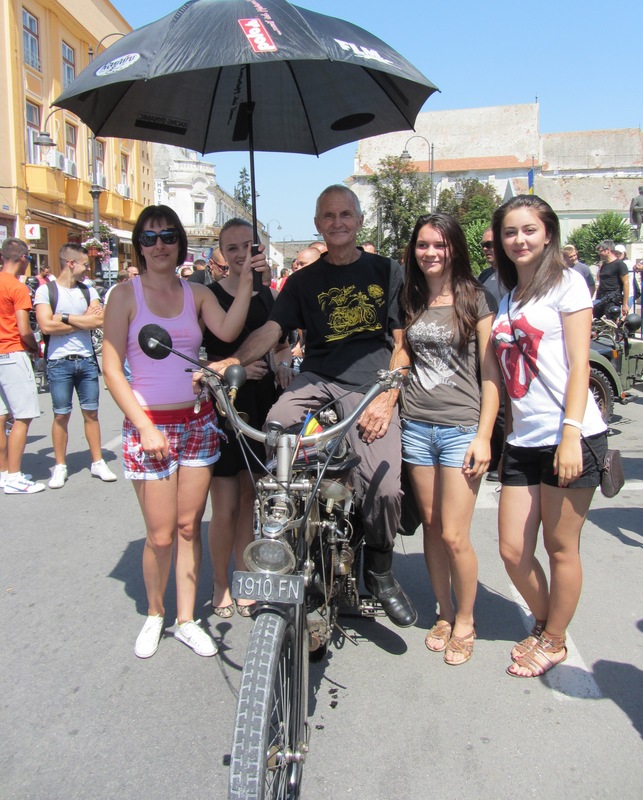 Founded in 1947, the Turda Rally is organized by the Transylvania Riders MC. In 2009 the last official race through the streets took place. Unfortunately opposition to street racing meant that this year there was only a parade of bikes through the town followed by a short sprint for each participant. Despite this, locals did get to check out the 30 or so bikes in attendance with the FN attracting a good deal of attention. A bevy of beautiful women surrounding us at the line…eat your heart out Valentino. Effie took part in the time trial and though she wasn’t able to get her front wheel off the ground or leave a cloud of smoke behind her, she didn’t let the side down, starting first go and achieving a respectable time. Thank you to the club for the old bloke award and the bottle of champagne. Enjoyed the cameraderie over the weekend & met some great people, including two guys travelling from the UK. Thank you Tim & Mike for your much appreciated support. It’s good to see motorcycling is alive and well the world over. For the next week Effie is taking a break while Lynne & I tour the rest of Romania. It’s a beautiful country with so much unspoiled beauty, some amazing architecture, much of it preserved as UNESCO world heritage sites. By the time I return to Turda to collect the bike, I’ll be only a couple of days away from August and another country. Here’s hoping the sun continues to shine – only one day’s rain in six months! Ron, congrats on approaching Budapest! From there you should be able to find roads that run through the Danube (aka Donau) river valley all the way through Vienna to at least Passau in Germany. Not sure exactly how that would place you but I’ve ridden from Passau to Vienna on a push bike and can attest to the beauty of the valley. Now about to leave Budapest after a lovely visit. It really is a beautiful city & enjoyed a very warm welcome. Approaching Germany from Czech Republic this time rather than double back, given Slovakia is so close to Vienna, but will keep it in mind for a future trip to do the route you recommended from Passau to Vienna. There’s definitely enough great places to warrant another visit. Not sure I understand all of your post, but yes this was me in 2011 during the winter with a bit of facial hair to keep out the cold. Not quite the same look now, just older. So good to hear from you guys. Fig jam was good but didn’t last long that’s for sure! Had another problem with Effie but located it and now she’s running a treat again. I still enjoy finding what makes this bike tick. Another week has gone by and no dramas. All’s good. I have a original 1910 FN saddle wich is wider and stronger than the one you’r using, and am in the area of Nürnberg – Praga when you are passing. Don’t worry Ron: Around here leaves kinda start to go gold in the beginning of August, but summer lasts till the end of September or even after that – indian summer, climate change and all that. At least you’re lucky in Transylvania, in Bucharest there are 4-6 degrees more. That’s in shade, on the asphalt it’s a heat stroke waiting to happen. Hope you’ll enjoy Romania (well, and the rest of your trip), sorry i didn’t get to see you and your fabulous bike. People everywhere I’ve been tell me the temperatures seem to be increasing – not good. So glad it’s a little cooler north than it is in Bucharest at the moment. Even had a light shower of rain last night though dont imagine it helped much. Sorry we didn’t get to meet up but nice to have you along for the ride via the blog. The Danube Delta tour was wonderful! At the Museum of Transportation in Budapest….but my hometown: Kaposvár (South-West of Hungary, “capital” of Somogy county) I think…not will be at the museum…but many club member live in Budapest. If you need help, while you stay in Hungary, please send an e-mail for me. Good to hear you had a wonderful ride through Romania. Thanks so much for your offer of help – I will keep it in mind. Had rain last night but looking good this morning. Thanks for your interest in my journey & enjoy the blog. Hi Ron, we are looking at you and Effie. Hamr – it is 100 kg hammer driven by water wheel – the year of the 1850th Enjoy the sunshine! My English is not good – Google Translate. The hammer sounds interesting & worth a visit. What area is it in? Having rain at last – just a shower, but it has definitely cooled things down a little and I’ve noticed the leaves are beginning to change colour, ever so slightly. I hope summer lasts a bit longer yet. Your English is fine, especially compared to my Czechoslovakian! Great to hear from you guys again! Thanks for the compliments – we’re just having fun Effie & me…and Lynne when she joins us. Bet there’s some bikes in this part of the world to add to your collection. Miss you both and hope to catch up again in the not too distant future. We met with you at Fagaras-south, after Lake Vidrau. We came from Hungary (Mz Club, tour Danube delta). You have an amazing journey! Zozy and the Mz Club Hungary! I’ve just been looking at the pictures from the Fagaras region, including the ones of meeting the Mz Club. Hope the Danube Delta Tour went well – it sure was an amazing ride over those mountains. if you’ve never done the north east region of Romania I can recommend it for scenery & good riding roads comparable to the Fagaras. Will be in Budapest on 5th August at the Museum of Transportation – press and other motorcyclists there. Maybe we’ll meet up again. Thanks for your good wishes.